BACKGROUND AND PURPOSE: The Neuroform2 stent has been increasingly used in the stent-assisted coiling of wide-necked cerebral aneurysms, mostly after pretreatment with antiplatelet drugs. We retrospectively analyzed our results of stent-assisted coiling without pretreatment with antiplatelets. METHODS: We used 50 Neuroform2 stents in the treatment of 54 aneurysms without pretreatment with antiplatelets. Anticoagulation included intraprocedural heparin, nadroparin for 3 days, clopidogrel for 3 months, and aspirin for 6 months. RESULTS: Forty-nine stents were successfully deployed, and 52 of 54 aneurysms coiled (51 totally occluded and 1 subtotally). There was only one case of intraprocedural thrombus formation that was easily treated with recombinant tissue plasminogen activator. No serious hemorrhagic complications occurred during the follow-up period, and all 18 patients whose aneurysms have been controlled with angiography were found to have patent stents without stenosis and no aneurysm recanalization. No aneurysm rebleeding has occurred. CONCLUSION: We believe that stent-assisted coiling with the Neuroform2 stent is very effective and safe without pretreatment with antiplatelets in ruptured as well as in unruptured aneurysms. The self-expandable Neuroform2 stent (Boston Scientific, Natick, Mass) is a novel device specifically designed for use in cerebral vessels and is increasingly being used in the embolization of wide-necked aneurysms. The stent serves as a means to contain coils in the aneurysm and prevent their prolapse in the parent artery (stent-assisted coiling). Because of its low radial force, the Neuroform2 stent is not intended for use in arterial stenoses. The use of a stent requires periprocedural anticoagulation and postprocedural antiplatelet treatment for 6 months to prevent thrombus formation. From the advent of stent-assisted aneurysm coiling, it has been considered necessary to pretreat patients with antiplatelet drugs for a few days before the intervention to avoid thromboembolic complications. 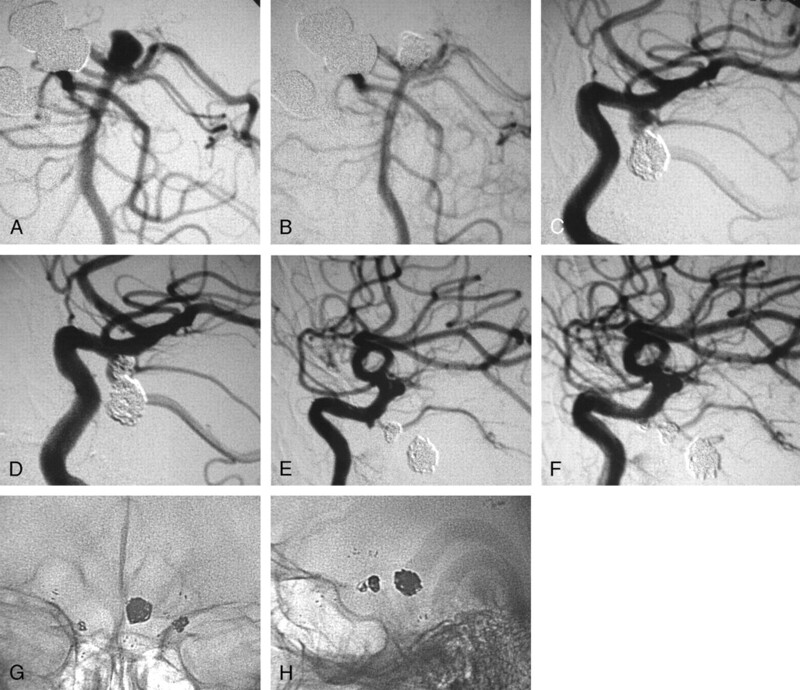 We present our series of stent-assisted coil embolization of acutely ruptured and unruptured wide-neck cerebral aneurysms without pretreatment with antiplatelets to demonstrate the safety of the procedure. We retrospectively analyzed the files of all patients with wide-necked cerebral aneurysms (dome/neck ratio <2) who were treated or attempted to be treated with stent-assisted coil embolization during an 18-month period (December 2003–May 2005). There was no patient selection and no inclusion or exclusion criteria. The patient group included 44 patients (17 men, 27 women) with a mean age of 52.1 years (range, 31–73) out of a total of 162 patients treated with aneurysm embolization during the same period. Most patients (n = 33) were treated in the acute phase after a subarachnoid hemorrhage, and the remaining 11 were treated for unruptured aneurysms. Of the 33 patients with a ruptured aneurysm, 23 (69.7%) were in good condition (Hunt and Hess I–III) and 10 (30.3%) were in severe condition (Hunt and Hess IV–V). These patients harbored 82 aneurysms (63 aneurysms in patients with subarachnoid hemorrhage and 19 in those without). Twenty-three patients each had 1 aneurysm, 13 patients each had 2 aneurysms, 3 patients each had 3 aneurysms, 2 patients each had 4 aneurysms, 2 patients each had 5 aneurysms, and 1 patient had 6 aneurysms. We used a total of 50 Neuroform2 stents to cover the wide necks of 54 of the 82 aneurysms (47 stents were used to cover the neck of 1 aneurysm, 2 stents were used to cover the necks of 2 aneurysms, and 1 stent was used to cover the necks of 3 aneurysms). Forty-one patients each received 1 stent, 3 patients each received 2 stents, and 1 patient received 3 stents. Of the remaining 28 aneurysms, 24 were embolized without a stent and 4 had to be microsurgically clipped. One additional aneurysm had to be clipped because the stent could not be delivered to the desired location. All endovascular interventions for ruptured and for unruptured aneurysms were carried out on the same or the next day of admission to our hospital, depending on referral from other hospitals (days 1 to 3 after subarachnoid hemorrhage for the ruptured aneurysms). Following diagnostic angiography and the discovery of an aneurysm considered to be adequate for coil embolization, the patient was immediately intubated and the procedure started with evaluation of the neck of the aneurysm. If it was estimated to be wide (dome/neck ratio <2) or equal/wider than 4 mm, the patient received 5000 IU of heparin, the stent was placed in the parent artery covering the neck of the aneurysm, and the aneurysm was microcatheterized and embolized with detachable coils. All stents were oversized by 0.5 mm compared with the parent artery. In short-duration interventions (1–1.5 hours), the patients received an additional 2500 IU of heparin upon completion and were started on a regimen of 0.6 mg of nadroparin subcutaneously twice daily. In longer-duration interventions (large, difficult, or multiple aneurysms), the patients received an additional 2500 IU of heparin every 1.5 hours, aiming for an activated clotting time (ACT) of approximately 200, and were started on nadroparin at the end of the intervention. All patients were started on 75 mg of clopidogrel and 100 mg of aspirin on the same evening or the next morning if the intervention was performed in the evening or during the night. Clopidogrel was continued for 3 months and aspirin for 6. Nadroparin was administered concurrently with aspirin and clopidogrel for 3 days. Treatment with nadroparin was not controlled with ACT measurements or other clotting tests. Forty-nine of the 50 Neuroform2 stents were easily delivered and deployed at the desired location, resulting in a deployment success rate of 98% (Fig 1–3). In 1 case, the stent did not reach the desired location (anterior communicating artery) because of severe tortuosity and elongation of the cervical internal carotid artery, resulting in insufficiency of the length of the stent delivery microcatheter, and the aneurysm had to be microsurgically clipped. 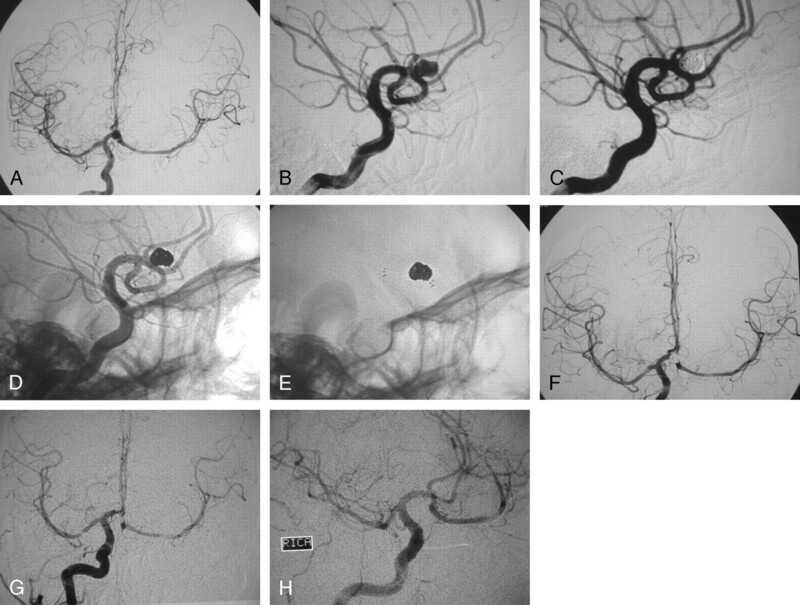 A, Digital subtraction angiography (DSA), working projection, in a 69-year-old woman who presented with subarachnoid hemorrhage from a ruptured wide-necked left internal carotid artery (ICA) aneurysm at the origin of the posterior communicating artery (PcomA). A pseudoaneurysm is noted at the fundus of the ruptured aneurysm. B, DSA, working projection. The aneurysm is shown embolized after the deployment of a 4 × 15-mm Neuroform2 stent in the ICA. No contrast material in the aneurysm is shown, and the PcomA is shown patent. C, Unsubtracted angiography, working projection, showing the stent in the ICA and the coils in the aneurysm. D, Unsubtracted view, working projection, showing the markers of the stent and the coils. E, Follow-up DSA of the left ICA at 17 months, anteroposterior projection. The aneurysm is not visualized and all the branches are patent. F, Follow-up DSA the left ICA at 17 months, lateral projection. The aneurysm is not visualized and all the branches are patent. A, Digital subtraction angiography (DSA), anteroposterior projection, of a 32-year-old woman with aplasia of the left internal carotid artery (ICA) harboring an incidental aneurysm of the anterior communicating artery (AcomA). The whole left hemisphere is supplied by the right ICA through the AcomA. Patency of the AcomA after the embolization was of the utmost importance. 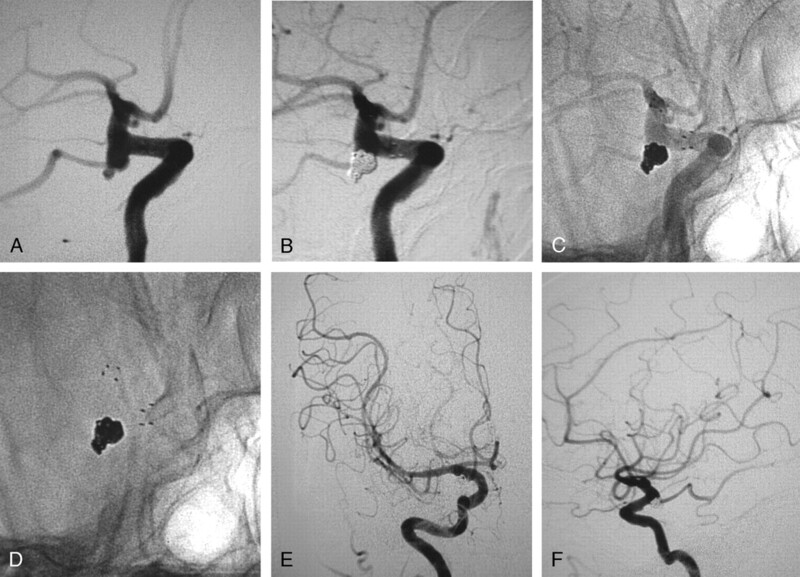 B, DSA, working projection for the embolization of the wide-necked AcomA aneurysm. C, DSA, working projection, showing the aneurysm embolized after the deployment of a 3 × 15-mm Neuroform2 stent in the A1 segment of the right anterior cerebral artery (ACA) extending to the AcomA and to the A2 segment of the left ACA, covering the neck of the aneurysm. D, Unsubtracted angiography, working projection, showing the stent in the AcomA complex and the coils in the aneurysm. E, Unsubtracted view, working projection, showing the markers of the stent and the coils. F, DSA, anteroposterior projection, after the embolization of the aneurysm showing the patency of the AcomA and the adequate supply of the left hemisphere. G, Follow-up DSA at 6 months, anteroposterior projection, showing the adequate supply of the left hemisphere from the right ICA. H, Follow-up DSA at 6 months, working projection, showing the persistent occlusion of the aneurysm and the patency of all the branches of the AcomA complex. A 30-year-old man presented with subarachnoid hemorrhage, and angiography revealed he harbored 3 aneurysms: 1 at the basilar tip and 1 on each internal carotid artery (ICA) at the origin of both posterior communicating arteries. The wide-necked basilar tip aneurysm was considered the ruptured one and was treated first with coil embolization. A, Digital subtraction angiography (DSA), working projection, showing the wide-necked basilar tip aneurysm incorporating in the neck the proximal left posterior cerebral artery. B, DSA, working projection. The aneurysm is shown embolized after the deployment of a 3.5 × 15-mm Neuroform2 stent in the basilar artery extending into the left posterior cerebral artery. C, DSA, working projection showing a wide-necked left ICA aneurysm at the origin of the posterior communicating artery. D, DSA, working projection. The left ICA aneurysm is shown embolized with the use of a 4 × 15-mm Neuroform2 stent. The posterior communicating artery is shown patent despite the prolapse of a small coil loop in its lumen. E, DSA, working projection, showing a third small aneurysm on the right ICA by the origin of the posterior communicating artery which was not opacified by the ICA injection. F, DSA, working projection. The aneurysm is shown embolized after the deployment of another 4 × 15-mm Neuroform2 stent. G, Unsubtracted view, anteroposterior projection, showing the proximal and distal markers of the 3 stents and the 3 coil masses inside the 3 aneurysms. H, Unsubtracted view, lateral projection, showing the proximal and distal markers of the 3 stents and the 3 coil masses inside the 3 aneurysms. Follow-up DSA is not available for this patient because he was a resident of a different country and returned home in excellent clinical condition. Of the 54 aneurysms intended to be treated with stent-assisted coiling, 53 (98.2%) were successfully stented and 52 were coiled (96.3%). Fifty-one (94.4%) aneurysms were totally occluded. In 1 patient (1.9%) with an unruptured internal carotid artery aneurysm, only partial occlusion could be achieved because of coil compartmentalization. Coiling was not possible in another patient with 3 aneurysms (anterior communicating artery, left posterior communicating artery, left middle cerebral artery). A stent was placed initially across the wide neck of the ruptured anterior communicating artery aneurysm but the aneurysm could not be coiled because it was not possible to microcatheterize it after the deployment of the stent. The patient was operated on immediately under anticoagulation with heparin, keeping the ACT at approximately 200, and all 3 aneurysms were clipped through a left pterional craniotomy with no hemorrhagic complication from the anticoagulation. After the operation, the patient was kept anticoagulated with heparin for 5 days and subsequently treated according to our protocol with aspirin and clopidogrel. No total stent thrombosis was observed after the deployment of the 49 stents. Periprocedural stent-related complications were observed with 2 stents (4.0%). Small thrombus formation inside the stent was observed upon completion of the embolization of a ruptured middle cerebral artery aneurysm and was easily lysed with mechanical manipulation of the thrombus and superselective infusion of 20 mg of recombinant tissue plasminogen activator without causing aneurysm recanalization. In another patient with a ruptured large (22 mm) aneurysm of the internal carotid, stent compression by the coils and partial obstruction of the parent artery was noted. The stent was expanded with a balloon, the coils were compacted in the aneurysm, and the obstruction was relieved without any sequelae. No thromboembolic events occurred in the postoperative period ranging from 10 days to 18 months. Three patients (6.8%) complained of easy bruising approximately 2 months postoperatively, and the clopidogrel dose was reduced to 75 mg every second day with no further bruising appearing and no thromboembolic complications. One patient (2.3%) had a mild epistaxis at 2 months postoperatively, and the clopidogrel was discontinued with no thromboembolic events subsequently. Outcomes were estimated by using the modified Rankin scale with “Good outcome” comprising grades 0 to 3 and “Outcome with severe neurologic deficit” comprising grades 4 and 5. All patients with unruptured aneurysms had excellent outcome, whereas in the ruptured aneurysm group, 21 patients (63.6%) had good outcome, 7 (21.2%) had severe neurologic deficit, and 5 (15.2%) died. In the group of patients with good presentation Hunt and Hess grade (I–III), the outcomes were good for 18 patients (78.3%), severe for 3 patients (13.0%), and fatal for 2 patients (8.7%). Severe outcome was due to shunt infections in 2 patients and to global cerebral ischemia after cardiac arrest in one. Both deaths were due to shunt infections. In the bad presentation Hunt and Hess grade (IV–V) patient group, the outcomes were good for 3 patients (30%), severe for 4 patients (40%), and fatal for 3 patients (30%). Severe outcome was attributed to severe post-subarachnoid hemorrhage presentation condition in all 4 patients. One patient died after shunt infection and 2 because of nosocomial pneumonia. All Hunt and Hess grade IV–V patients, as well as those Hunt and Hess grade I–III patients who deteriorated, were treated in the intensive care unit and were submitted to serial CT scans. No signs of stent thrombosis, infarct in the territories of the stented arteries, or aneurysm rebleeding were noted in repeat CT scans. Control angiography was not performed in the acute phase in these patients. Nevertheless, we indirectly concluded no stent-related complications occurred in the group of patients who had an unfavorable outcome or died. Of course, it is possible that a patient might have suffered a massive stroke from stent thrombosis and died before we had the opportunity to perform a CT scan, but we consider it unlikely because of the patients’ clinical course. Twelve of the 44 patients treated with stent-assisted coiling have died or had a bad outcome and are not available for follow-up angiography. Of the remaining 32 patients, only 18 (56.25%) with initially totally occluded aneurysms have been available up to now for follow-up angiography after the period of 6 months postoperatively. In all controlled patients, the aneurysms coiled with a stent covering the neck have been found stable and totally occluded with no signs of recanalization. All stents were found patent without any signs of in-stent stenosis or angiographic signs of clinically silent distal embolic events in the stented arteries’ territories, and no aneurysm rebleeding has occurred. Wide-necked aneurysms have always been very difficult to treat endovascularly because of the risk of coil protrusion in the parent vessel and subsequent thrombus formation. A large percentage of such aneurysms were amenable to coiling after the introduction of the balloon-assisted coiling technique and of 3D coils. Stent placement in the parent artery to cover the wide neck of the aneurysm and prevent the coil mass from protruding into the artery was the next step. Nevertheless, the only stents available initially were designed for coronary use and proved to be too rigid to easily navigate into the distal cerebral vasculature. Therefore, most attempts were unsuccessful at delivering the stent at the desired location. The Neuroform was the first stent designed specifically for use in cerebral vessels. Its ultrathin construction renders it very flexible and navigable and allows it to reach vessels even distal to the circle of Willis. An increasing number of publications have reported on the use of the Neuroform stent in the embolization of wide-necked aneurysms. The largest series published to date is that of Benitez et al,1 with 56 patients harboring wide-necked aneurysms. Stent deployment succeeded in 48 patients, resulting in a technical success rate of 85.7%. Stent placement and coiling was performed in 41 of 49 aneurysms (83.7%), stent placement only in 6 aneurysms (12.3%), and 1 aneurysm was initially coiled and then stented. The overall complication rate was 10.7%, with 7.1% considered to be related to the procedure. Lylyk et al2 reported on the use of Neuroform stents in 50 patients with wide-necked aneurysms, almost half of whom presented with subarachnoid hemorrhage. Of the 50 patients intended to treat initially, 46 with 48 aneurysms were treated, for a technical success rate of 92%. Stent deployment was optimal in 81.2%, but the authors reported difficulty in stent placement in one third of cases. The procedure-related morbidity and mortality were 8.6% and 2.1%, respectively. It is interesting that in 1 case, only a stent was deployed, without aneurysm coiling, and progressive thrombosis of the aneurysm was noted at follow-up. Jabbour et al3 reported a series of 32 patients treated with Neuroform and coiling for unruptured wide-necked aneurysms who were pretreated with antiplatelet agents. Total or near-total occlusion of the aneurysm was achieved in only 75%, and no occlusion was achieved in 15% of the cases. The complication rate was 6.3%. In a recent article, Akpek et al4 presented a series of 32 patients with 35 aneurysms, only 4 of which were ruptured. Stent placement with Neuroform was successful in 34 of 35 aneurysms, and coiling was successful in 33. Total or satisfactory occlusion was achieved in 20 aneurysms (57.1%). Adverse events occurred in 25% of patients; 9.3% resulted in permanent neurologic deficit. Thrombus formation in the stent was noted in 6 cases (18.8%). In the series published by Fiorella et al,5 the authors’ preliminary experience with the Neuroform stent was presented. They report on 19 patients with 22 aneurysms, but only 5 ruptured ones. Twenty-five stents were deployed, and technical problems were encountered with 11 of these (44%), including difficulty or inability to deploy the stent, inadvertent stent deployment, stent displacement, and coil stretching. Twenty-one of the 22 aneurysms were treated, 17 with stent placement and coiling (81%) and 4 with stent placement only. Of the 17 coiled aneurysms, total or near total occlusion was achieved in 6 aneurysms (35.3%), resulting in a procedure success rate of 27.3% (6/22). There were 2 clinically significant thromboembolic events (10.5%) resulting in 1 death (5.3%). In the article by dos Santos Souza et al,6 the use of Neuroform in the treatment of 18 patients with wide-necked aneurysms is reported. Approximately half of the patients (44.4%) presented with subarachnoid hemorrhage. Satisfactory aneurysm occlusion was achieved in 64.8% of cases, whereas there was 1 technical failure and 4 (23.5%) technical complications. There were no major clinical complications or deaths. Regarding outcome, it was favorable in most patients (88.2%). Sani et al7 reported on 10 cases treated with the newest generation of Neuroform Treo, a slightly more rigid version of the stent. The authors had no difficulty in deploying all stents and no technical complications. One case needed retreatment because of recanalization found at follow-up. This has been our experience as well, because we met no significant difficulty in navigating and deploying the stent at the desired location. Coiling after deployment of the stent has been possible in all but 1 case, in which we could not catheterize the aneurysm. Total aneurysm occlusion after stent placement has been achieved in all but one case, and there has been only one minor thromboembolic event with no clinical significance. Since the advent of the Neuroform2 stent, in a period of 18 months we had to treat only 5 patients (3%) microsurgically of a total of 165 admitted to our department. These cases include the 2 failures described above (1 stent deployment failure and 1 coiling failure) and 3 cases of aneurysms with arterial branches incorporated in the sac that had to be treated with clip reconstruction of the branching vessel lumen. Therefore, in our practice, the Neuroform2 stent has significantly lowered the percentage of aneurysms that cannot be treated with endovascular interventions. It is very interesting that some reports on unconventional use of the Neuroform stent have provided intelligent technical solutions to difficult endovascular cases. Henkes et al8 successfully deployed 2 stents in a “kissing” configuration to treat a fusiform aneurysm of the upper basilar trunk, whereas Thorell et al9 and Perez-Arjona and Fessler10 reported on a Y-configuration deployment of 2 Neuroform stents applied in the treatment of a wide-necked basilar tip aneurysm. The use of the Neuroform stent can lead to complications as reported in the above-mentioned articles. Furthermore, in an article published by Broadbent,11 2 cases of complications are presented, 1 with dislodgment of the stent during microcatheterization and 1 with movement of the stent inside the sac of the aneurysm. Our experience has shown that slight distal movement of the stent occurs frequently during attempts to catheterize the aneurysm despite oversizing the stent by 0.5 mm. This has led us to deploy the stents slightly more proximally than the optimal position, allowing for a small distal movement during the catheterization to reach the optimal position. Regarding long-term complications, Fiorella et al12 reported on a case of delayed in-stent stenosis after the use of the Neuroform stent in the coil embolization of a wide-necked aneurysm. In our series, we experienced no severe complications, apart from 1 case with minor in-stent thrombus formation periprocedurally, and no in-stent stenosis was present in the cases we were able to follow up with angiography. This low rate of periprocedural thromboembolic events has been achieved with no pretreatment of our patients with antiplatelets in either the ruptured or in the unruptured aneurysm cases. This protocol of anticoagulation starting only during the procedure has initiated from the large amount of ruptured aneurysm cases we receive in which there is no time for pretreatment and the risk of preprocedural anticoagulation probably outweighs the benefit. Because we had no significant thromboembolic complications by using this protocol in the ruptured aneurysm cases, we started applying it to the unruptured ones as well, with the same good results. Consequently, we feel that pretreatment with antiplatelets for stent-assisted coiling of aneurysms is not necessary if meticulous technique is applied and anticoagulation initiated during the procedure is maintained adequately for the necessary amount of time. Furthermore, the avoidance of antiplatelet pretreatment and the use of initial anticoagulation with heparin instead of antiplatelets allows for safe surgery in case it might be necessary (uncoilable aneurysm after stent placement, hematoma evacuation after aneurysm rupture, etc), because heparin anticoagulation is more easily controlled and can be partially reversed, in contrast to antiplatelet drugs. Upon completion of the intervention, heparin was discontinued and anticoagulation was preserved for 3 days with nadroparin. Our rationale for the use of nadroparin instead of heparin was based on the fact that low molecular weight heparins (LMWH) have been shown in recent years to be more effective and safer than heparin in the prevention of thromboembolic events after coronary angioplasty and stent placement.13–16 Heparin has some advantages (lower cost and easy reversibility), but LMWHs are more easily administered with a simpler dose regimen, require no monitoring of anticoagulation levels because of their predictable effect, and have exhibited superior clinical safety. Furthermore, unfractionated heparin administration can sometimes lead to transient rebound hypercoagulability.17–19 Because coronary stent placement has preceded that of cerebral vessels and the experience gained by interventional cardiologists in the field of anticoagulation is enormous, it seemed logical to follow their practice. Therefore, our protocol was inspired by numerous publications advocating the use of LMWH instead of heparin for short-term anticoagulation. We decided to use an LMWH, and we chose nadroparin because we had extensive experience with the specific drug in our department after having used it for years in the prevention and treatment of deep venous thrombosis. Our results seem to indicate that this combination of periprocedural heparin administration with short-term anticoagulation with nadroparin and long-term antiplatelet treatment with aspirin and clopidogrel is capable of minimizing the risk of thromboembolic complications after stent-assisted coiling of cerebral aneurysms with a very low rate of low-significance hemorrhagic complications. The Neuroform2 stent has proved to be an important addition to the armamentarium of the neurointerventionists, providing solutions in the treatment of wide-necked aneurysms. It has significantly altered our practice by augmenting the percentage of aneurysms that are now amenable to endovascular treatment. Pretreatment with antiplatelets has not seemed necessary in our series with a very low thromboembolic complication rate. Short-term (3 days) anticoagulation after stent deployment with nadroparin instead of heparin has proved both effective and safe. No aneurysm rebleeding was observed, and no aneurysm recanalization, stent stenosis, or thromboembolic events have been noted in the patients available for follow-up. What remains to be studied is the long-term effect of the stent on the vessel wall and the rate of aneurysm recanalization and delayed in-stent stenosis. Accepted after revision September 10, 2005.